A new era in the democracy movement in Hong Kong began on July 1, 2003, when half a million people protested on the streets, and has included the 2012 anti-National Education campaign, the 2014 Occupy Central Movement and the rapid rise of localist groups. The new democracy movement in Hong Kong is characterized by a diversity of interest groups calling for political reform, policy change and the territory’s autonomy vis-à-vis the central government in Beijing. These groups include lawyers, teachers, students, nativists, workers, Catholics, human rights activists, environmental activists and intellectuals. This book marks a new attempt at understanding the activities of the various interest groups in their quest for democratic participation, governmental responsiveness and openness. They are utilizing new and unconventional modes of political participation, such as the Occupy Central Movement, cross-class mobilization, the use of technology and cyberspace, and human rights activities with cross-boundary implications for China’s political development. 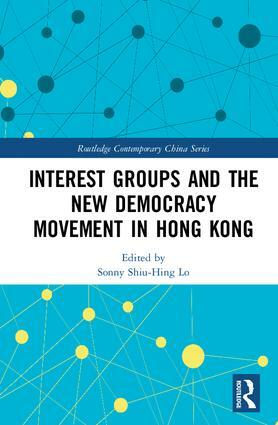 The book will be useful to students, researchers, officials, diplomats and journalists interested in the political change of Hong Kong and the implications for mainland China. Sonny Shiu-Hing Lo is Professor and Deputy Director in the School of Professional and Continuing Education at the University of Hong Kong.